...to all our chinese customers and friends. Legend has it that in ancient times, Buddha asked all the animals to meet him on Chinese New Year. Twelve came, and Buddha named a year after each one. He announced that the people born in each animal's year would have some of that animal's personality. Those born in ox years tend to be painters, engineers, and architects. They are stable, fearless, obstinate, hard-working and friendly. 1. In camel racing the jockeys are electronic robots. 2. Barack Obama's chief speechwriter is 27 years old. 3. Indonesia is the world's largest exporter of edible frogs. 4. The fast food that generates the most litter is McDonald's. 5. An intense ketamine high gives an out-of-body-experience known to recreational users of the horse tranquiliser as the "K-hole". 6. John the Good was bad and William the Bad was good. 8. In Britain it is illegal to kill a bat or disturb the places where they roost. 9. Using both hands to read Braille achieves an average speed of 115 words per minute, compared with 250 words per minute for sighted reading. 1o. The age at which we are most vulnerable to depression is 44, while a 70-year-old who is physically fit is, on average, as happy and mentally healthy as a 20-year-old. You decide. Early this year, the Wildlife Resources Division will present five designs for a new nongame wildlife plate on http://www.georgiawildlife.com/. The separate designs will include a green treefrog, a right whale, a red-headed woodpecker, an owl (species to be decided) or an eastern indigo snake. These are animals and settings that represent what Wildlife Resources’ Nongame Conservation Section does – work to conserve wildlife, rare plants and natural habitats. The top tag design will grace the vehicles of conservation-minded Georgians as early as spring, joining the hummingbird and bald eagle plates as critical fundraisers for the Nongame Conservation Section. Here’s where you come in. Check http://www.georgiawildlife.com/ starting in mid-January for a survey showcasing the new plate designs. Review the designs. Pick the ones you like. Then tell your friends to do the same. Remember, $22 of the one-time $25 fee for the purchase of each plate goes to Georgia’s Nongame Wildlife Conservation Fund. Wildlife plates are the fund’s top source. Tag sales made up two-thirds of the money raised in fiscal 2004-2007. By matching grants and supporting projects, the fund is used to conserve animals not hunted, fished for or trapped, as well as native plants and habitats. The Nongame Section receives no state appropriations for this mission. Your support is vital. Your vote on the new plate is needed. With sales of the bald eagle and hummingbird plates gradually decreasing – not unexpected considering the older designs and rising number of advocacy plates – “We thought it was time … to have a fresh look for the plates that support our section,” nongame Assistant Chief Lisa Weinstein said. 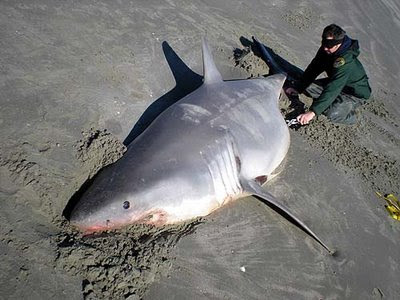 A few months back a 13ft Great White washed up on the beach just south of Charleston. With no obvious signs, it was not immediately clear why it died. It is very unusual for this species to be in southern waters. They like deep cold water. But it's O.K. There are no Great Whites on the GA Coast. 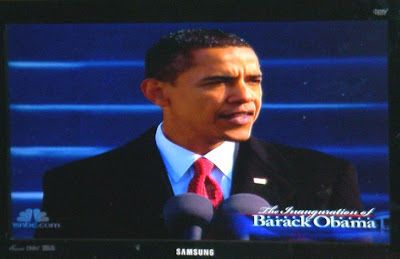 Obama's in the House ! Well done, America....a great step for all Beings. Channel Storms Bring Woody Windfall. The winter storms beat down and churn the cold Atlantic waters into a maelstrom of fearful proportions. As kids we would stand on 100ft cliffs at St Aldhelms Head and still be drenched by over spray from the huge pounding surf below. But, of course, every storm has an end and when it does, it's time to head to the beach and see what has changed, what is new. In this case it's 2000 tons of cut lumber. This is the second time in a year that a load of lumber has been lost in the English Channel. This picture was from last January when a ship went down off the Dorset coast. 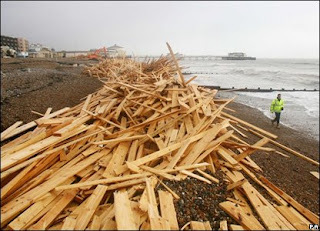 A week later 100 miles up the channel near Brighton much of the wood came ashore. The town now celebrates the event with a week long art festival named after the ship that sank ...Ice Prince . and invite the squirrels upon your chest. laid down, oiled down, with the squirrels on your chest. ...and a NE wind blowing makes for little enjoyment on the water. So we called up Jonathan Stalcup and, with hot chocolate in hand went, for an architectural walk. Living in a town of such wealth and interest, it's great to be able to call upon the expertise of person and dig a little deeper into our existence. Don't be fooled by his earmuffs...Jonathan is the man when it comes to Greek revival, Neo classical and Federal building styles. This is the best way to stroll across town. Ossabaw Foundation Meeting A Great Evening. Nearly 100 people turned out on chilly night to for Ossabaw Island Foundation Annual meeting last night. We went to see Buddy Sullivan give a presentation and get the scoop on what's happening on this awesome piece of the coast. A little background inf0 about Ossabaw..
As well as the annual meeting it was Sandy Wests' 96th birthday, so we all sang 'Happy Birthday' to the last remaining member of the Torrey West family to live on the island. 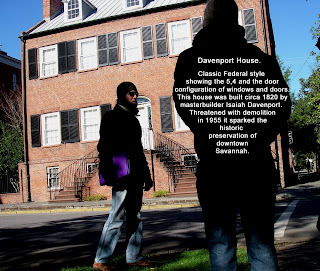 Restoration of several of the slave houses has been completed to their pre 1860's state. The island now has a comprehensive weather station as well as two deep water wells with sensors providing numerous amounts of data. The whole island has 'connectivity', with the implementation of several telescoping 100' towers. This all enables students and researchers to download real time data from just about any location in the world. It's all part of maintaining Ossabaw Island as a pivotal and unique island for research and study. There were over 230 turtle nests on Ossabaw this last nesting season..the third highest on the Ga coast. A new marina and condos will not be built at any time in the future. Ossabaw will never be developed. SC&K, in conjunction with Ben Lawry will be announcing the launch date of Ben Lawry's forward stroke clinic on dvd. This project was delayed several months due overcrowded scheduling, technical hold ups and prolonged periods of boredom. However, we think all these issues have been solved and the finished product will be hitting shelves quite soon. We will be having a pre-screening here at SC&K HQ just prior to it's release, so stay tuned for an invite. 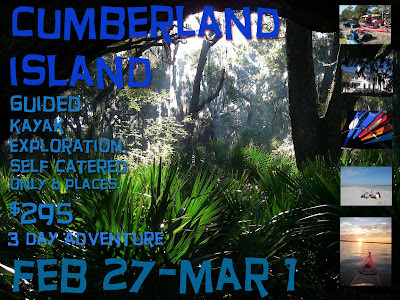 GA Coast Expedition Dates Announced ! from Tybee on Monday November 2nd. For the next five days we will paddle the best part of the Ga coast. We will pull out near Darien and shuttle back to Tybee Saturday Nov 7th. 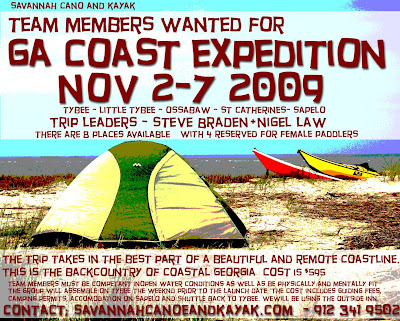 If interested in joining this trip drop us a line with your paddling credentials. Full details will posted on the website soon. Tents and stoves available to rent. Another Free Mega Surf Boat ! 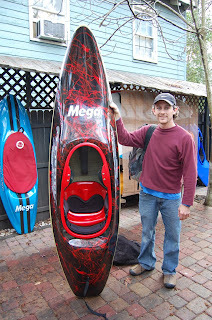 Robert Taylor was here today to pick up his free composite Mega Surf Kayak. Robert won the striking red and black carbon Kevlar Merlin a while back when he entered Mega's 'name the boat' competition. Savannah Canoe and Kayak was glad to help with the shipping of the boat across the pond.
" I thought the name should start with an 'M', like Malcolm and Mega and that the boat looked wizard like with the very up swept bow" said Robert when I asked him how he came up with the name Merlin. After Robert's kids jumped in the boat, dad tried it on and found it a perfect fit. We then headed out to the beach for a quick 'splash and slash'. What a great way to start the year...$2000 of super fantastic high performance surf boat compliments of Mr Mega. This is the second Mega surf boat give away SC& K has been involved with in the last few months. A big thanks to Malcolm Mega for putting up continued incentives and great support for the paddle surfing scene. Rock on big daddy, we love ya ! All the very best for the next ten years. Theses are critical times. Patiently and persistently, and we will be successful. "That was then, but this is now". I like it. Simple, safe, effective.